and Muslims in different journals. Mekteb-i Nuwwab. This was a school established by the Austrian-Hungarian monarchy to educate Muslims judges, and after that the school was upgraded to the level of the faculty. Several years ago, this faculty became a part of the Sarajevo University. 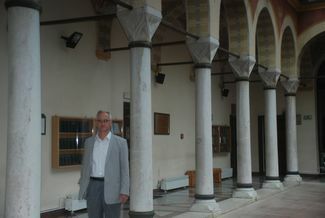 So this school actually possesses a double identity which is the educational institution of the Islamic community, and in that sense it is financed mainly by the Islamic community, and the lecturers are appointed by the Islamic community, but at the same time the school is a part of the Sarajevo University. This faculty has two departments, the department of Islamic theology, like the ‘Usul el Din’ in Arabic, and the departments of religious education. There is also a third department, the department for the education of the imams and hatips. There are three departments, and each department receives an enrollment annually of about thirty students, all together we are talking about three hundred students that will study at this faculty. Comparing to the years in the past, has there been an increase or decrease in the interest towards the school? Yes, the interest is quite stable; the interest of the past several years indicates that it is stable. And it is efficient for the needs of the Islamic community in Bosnia. Apart from this faculty, there is also a faculty of Islamic pedagogy in Zenica and in Bihac, therefore we have three faculties which deal with Islamic studies in Bosnia. Does this meet the needs in Bosnia-Herzegovina? Yes, definitely, this is sufficient for Bosnia-Herzegovina. What about the perception of Prophet Muhammad (pbuh) and Islam among Bosnian people, is there a difference before and after the war for example? Now, talking about our Prophet Muhammad, with the spread of Islam here during the Ottoman times, we have accepted Islam, we have accepted the Sunni type of Islam and the Hanafi madhab like in an Ottoman state, and Prophet Muhammad is always considered by Bosnian Muslims as the model of human behavior, and like other Muslims we try to follow his words and his acts, his deeds and his sunnah. I can tell you that for example in their folk practice of Bosnian Muslims that on a regular basis we have a celebration of the Mawlid of the Prophet. And during the Ottoman times it was celebrated by the reciting of Süleyman Çelebi’s mawlid in the Turkish language. But since the 19th century we have had Mawlids in the Bosnian language, and today we have a very interesting custom here in Bosnia that we don’t celebrate the Prophet’s birthday only once. We celebrate the Prophet’s birthday on the Rabi’al-awwal for months. What kinds of organizations or programs do you arrange on such occasions? Usually there is a recitation of Mawlids, qasidah, and a vaaz which is kind of advises to the Muslims on how to live their life. But when we compare the situation in Bosnia before the war and today, we can say that actually today we have more young people in the mosques, in the masjids, and the interest in Islam is increasing. What about Islam as a lifestyle in Bosnia… Is there a unique style to Bosnia- Herzegovin; how do people integrate Islam within their lives? When we talk about Islam in Bosnia, I would say that what we have here as the Islam heritage is actually something which we have inherited from the past, from the Ottoman times. We have also undergone a modernization process from Austria-Hungary onwards, and we have also learned how to manifest and live Islam in a secular state. As a lifestyle, I would say that in daily practice we have inherited a lot from the Ottomans and we have preserved that. For example, when we talk about our basic terms in our language, in the Bosnian language that are related to religion, they are mainly Turkish impressions like namaz, abdest and so on. They are not Arabic terms, but mainly Turkish expressions because of the fact that Bosnia-Herzegovina today as a part of the former Ottoman state, was a part of the Ottoman-Turkish culture of the Muslim world; so was also deeply influenced by those elements in the daily life. And in one period under the communist rule, actually religion was confined to the private life, but later on, after 1990 and onward we had a more public manifestation of Islam. What comes interesting to me about Bosnia is that the competition of modernism and secularism with Islam, with religion, is not as harsh as for example we have experienced in Turkey. Can we really say that for Bosnia? Yes, that is a correct observation. As I mentioned, we experienced modernization from the Austrian-Hungarian times, and after that the kingdom of Yugoslavia and finally a socialist or communist Yugoslavia. During the communist period, religion was under pressure, was put on the margins of the life, and atheism was considered as the official ideology. But since 1990 onwards, when we introduced the democratic reforms, and when we opted for a multi-party system, the situation changed dramatically: the communist party lost power, and different parties including Muslim based parties entered politics, and the type of secular state which we accepted is much more similar to the United States of America’s style than French. What I see for example in Turkey, we can say that system is very similar to the French model, while in Bosnia we are opting for the American model, in that case there is no clash between secular forces and religious forces. When we think about the Islamic world in general, where do you see Bosnia with its unique stance in this sense? I see Bosnia as a part of Europe, and a part of the European Muslims, and within European Muslims we can talk about regional identity which is the Muslims of the Balkans. The Muslims of the Balkans where Bosnia belong actually - in the past, about one hundred years ago- the whole area from the Adriatic Sea to the Black Sea was inhabited 60% by Muslims, so we and other Muslims of the Balkans, we belong to the same identity. But today when we see a process of integration into Europe among other Balkan states, in the future I see Bosnia as a part of the European Union, and the Muslims of Bosnia as a part of the European Muslims, in that sense I assure you, that when you talk about the Islamic world, that our closest friends and the most similar in terms of customs and daily life are the Turkish Muslims. When we talk about Europe, taking the Islamophobia and the fear of Islam into consideration, can we say that Bosnia has to play a different role for the future as a European and a Muslim country? To counteract or to deal with Islamophobia is a very big challenge actually, we have very deep roots of Islamophobia in Europe and in the West, and one of the deepest roots, actually one of the causes of Islamophobia in Europe is the so-called fear of Turks. You know that after the second siege of Vienna and from that time onward, people in Europe developed a kind of fear of Muslims, in the past they used to say the fear of Turks, but Turks was used in the meaning of Muslims. In Bosnia in the post-Ottoman period, we experienced terrible tragedies as you know, and very often we see that the crimes that were committed against the Muslims in the Balkans were justified, or were trying to be justified by Islamophobic rhetoric and Islamophobic arguments. So today Europe, especially the European Union or what was known as the former Western Europe is facing a challenge of the Muslim migrants and new Muslim presence in Europe. In the past Muslims used to live only in the Balkans, but now we have Muslims in other European cities and towns. The causes of Islamophobia in Europe are much deeper and this is related to the issue of the European identity, whether Europe is only a Christian identity or a multi-cultural identity, and the issue of the integration of the foreign workers, and the immigrants and their children etc. So the causes are very different, and I am afraid that Bosnia-Herzegovina cannot do much in that sense because of the fact that Muslims in Bosnia are actually facing a challenge of Islamophobia in the Balkans from their own neighbors. But what we can show by our own example is to manifest that it is possible to be a European, and to be of the Muslim faith. In terms of the relationships with Europe, Bosnia is a part of Europe, and almost all of the Bosnians consider themselves righteously as Europeans, but do Europeans see Bosnians as Europeans? That is the usual perception that we have. When we talk about Europeans of course we have Europeans of different kinds, but for example from my own experience of talking to intellectuals from different parts of Europe and from different European countries, they always perceived Bosnians as Europeans, but of course I am talking about intellectuals, and about those who support the multi-ethnic concept of the European identity. What about the relationships of Muslims with the other ethnic groups or religious groups in Bosnia? It is improving, but there is still tension, and the tension can be seen in areas with a mixed population, and the main reason is that especially among Serbs and to a certain extent among the Croats, there was no true confrontation with their past. Horrible crimes were committed against the Muslims in the past during the war of 1992-95, and people on whom behalf those crimes were committed, should confront with what happened in the past. So dealing with the past and heritage with the past, and especially the last war in Bosnia is the cause of this tension. Can’t a structure be built that would contain all the religious and ethnic groups? Yes, we are talking about a state in Bosnia, about common institutions, political institutions and that is possible and we do see some institutions that function like the army. Bosnian army forces are functioning quite well and if politicians from different ethnic groups follow the example of the reform of the army, then they can achieve much more. What about on the level of society? What kind of structures can be developed among individuals? On a daily basis the most important thing is the daily communication. If we improve our daily communication -communication on the local level and communication in the working places and so on- we can also achieve much more. Can Islam play any role in this process? 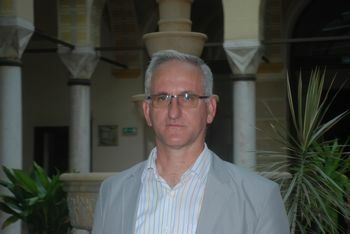 Yes, for Bosnian Muslims, Islam can play a very important role because Islam gives us answers on how to deal with our friends, and how to deal with our neighbors and Islam tells us what kind of values are important in our lives, and we know that one of the highest values in Islam is justice, so therefore we ask for justice to be served for all those who were responsible for the crimes in the past. But also Islam includes among its values ‘Salam’ which is peace, and we learn actually, and we try to find inspiration in the Islamic teachings while we are dealing with non-Muslims. 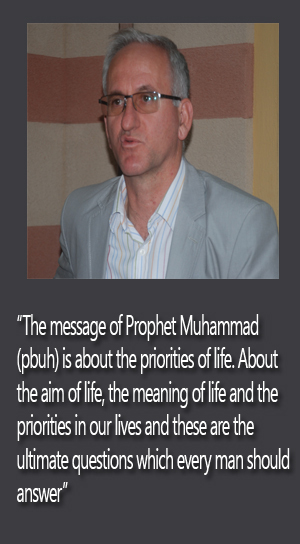 Does the sunnah of Prophet Muhammad has a determining place in the daily lives of the Bosnian Muslims? How is it being implemented in the daily lives of the people here? When we talk about the sources of Islam, in the first place is the Qur’an, in the second place is the sunnah of the Prophet. Of course as Muslims, especially when we talk about how to arrange the daily life, we know that the best example is the Prophet, and the Bosnian Muslims are trying as much as they can to emulate, to follow the Prophet in their daily lives. It is the main source of inspiration. So, is Prophet Muhammad known in Bosnia sufficiently? It depends actually on who you ask of course. When we talk about the Bosnian Muslims, we are talking about people of different levels of religious education. Of course those who are educated in Islamic schools, in Islamic high schools that we call madrasas and if you ask graduates of those schools, they will know sufficiently, and if you ask graduates of the faculty of Islamic studies they will know all about this. Even those who receive a religious education in public schools, actually they know elementary things about Prophet Muhammad and his life. But there are also people who are not sufficiently educated in religion, so it is a responsibility of the Islamic community to try to reach them, and also that is indicated of the interest of those people in Islam and in their own identity. What kind of policies could be pursued, what can be done in order to introduce Prophet Muhammad to these people who do not have a sufficient religious education? And if we can expand the content of the question, how can we introduce Prophet Muhammad to the Western world in general? Turkey at the level of high schools. So all students, pupils that finish those schools know basic things about Prophet Muhammad. In addition we have a lot of books that are published about the Prophet’s life. For example we now have a collection of hadith translated into the Bosnian language, and of course during Ramadan we have religious programs on television. So for those who are interested there are sufficient sources… Now of course your question is how to reach those who are not interested, maybe the Islamic community… When you say the Islamic community it means the administration of Islamic affairs like the Diyanet in Turkey, it might be more proactive to reach people with good publications. Of course when we talk about the Prophet’s Mawlid, we should try not to only have manifestations in mosques, but also to try to reach them in other ways. But that is a general problem: how to reach out to young people not only regarding Prophet Muhammad, but also in terms of religion generally. I would say that it would be very interesting and important to try to relate the message of Prophet Muhammad to contemporary times. We have a number of books about the Seerah, about the biography of the Prophet, and we know about every single detail. But in my opinion it will be important to see what is a relevant, contemporary meaning of the message of Prophet Muhammad and what the Prophet says to the people of the 21st century. What do you think that this message says to humanity? What I think that message would say is about the priorities in life. About the aim of life, the meaning of life and the priorities in our lives, and these are ultimate questions, basic questions which every man ultimately at the end should answer. The objectives of life, aim of life, meaning of life, and if we correctly answer those questions, how to arrange secondary questions such as how to arrange life will be answered easier. Today’s contemporary man is in search of the values: what are the values in life? In that sense, the hadith of the Prophet can serve as a very important source of inspiration. Is the problem that we are living today is that we are mixing up place and the range of priorities? I think so, we have to establish a kind of hierarchy of priorities. Finally, is there anything that you would like to add? The only thing that I can add is that I have read about your organization, Lastprophet.info, and I would like to support your activities in that sense. It is very important that you have it in mind to develop websites and publications in different languages, to reach out to people that speak languages other than just the Turkish language, so I wish you success. Thank you very much, insha’Allah in the near future we will be translating the site into the Bosnian language. Please type '527' into this field.